There are few better places to visit than India while you are in your twenties. Vast, diverse, challenging and constantly surprising, it is uniquely qualified to help you broaden your world as well as figure out your true nature. Here is our list of the twenty best things to do in India while in your twenties. Cannabis use is illegal in India, except when sold as bhang – a drink of ground cannabis leaves mixed with milk and a variety of spices – during festive season. The holy town of Varanasi is particularly known for its bhang culture, so make sure you get your glass full when here. The Andaman Islands, located off the coast of mainland India are among India’s most rewarding yet underrated tourist destinations. One of India’s best scuba diving locations, this is the perfect destination if you are seeking to immerse in nature. India has a burgeoning music festival scene, which you shouldn’t miss out on – particularly if you’re in your twenties. Housed in the 17th-century Alsisar Mahal in Shekhawati, Rajasthan, Magnetic Fields is a young, multi-genre music and arts festival that you should visit – if not for its rich, local electronic artist lineup, then for its sense of community. The state of Tamil Nadu has quite a few surfing spots that have mostly remained a local secret. Check out Manapad Point in Kulasekharapatnam to get in on a truly local secret and for one of the best surfing experiences you can have in the country. Formed by thousands of years of lava deposits, the point is uniquely beautiful. Kasol in Himachal Pradesh is among the most pristine, picturesque villages you can find in India. One of the most popular backpacking sites in India, Kasol is a must-visit destination for young adventurers in the country. India has vibrant regional liquor brewing cultures which have been under the radar of tourists for the most part. Try one of the many local liquors brewed around the country for a break from your quarter-life crisis infested mind. Kallu from south India, Tongba from Sikkim and Mahua from central India are all good options. Go camping in one of the world’s largest salt deserts, the Rann of Kutch in Gujarat. With seemingly endless stretches of sparkling white sand for company, you can find a moment of peace to temporarily break from the demands of your youthful restlessness. Bazaar hopping is always among the most exciting things you can do in Indian cities. Chor Bazaars or thieves markets – where you can find all sorts of antiques and eccentric items – are inherent in most large cities’ market cultures. Drop by Mumbai’s historic Chor Bazaar to get a sense of how wild these can be. Set in Arunachal Pradesh’s remote Ziro Valley, this popular multi-genre music festival is a vibrant celebration of not just music, but also youth. In the company of young and energetic crowds, and surrounded by paddy fields, with snow-capped peaks and silhouettes of forests framing the background, you can’t possibly feel more young, wild or alive than when at Ziro. India’s English stand-up comedy scene is, for the most part, very young – mostly run by artists in their twenties and thirties. Make sure to visit one of the city’s comedy clubs for a truly relatable dose of humor shared with a crowd your age. Canvas Laugh Club in Mumbai is among your best options in the country. Home of India’s best known hashish, Malana Cream, this ancient village just an hour from Kasol in Himachal Pradesh is a fabulous destination to visit for many reasons. Malana is known for managing to seclude itself from outsiders just about as much as it is known for its cannabis. If you’d like to set yourself up for a spook, there’s no better place to visit than India’s most haunted site – Bhangarh in Rajasthan. A 16th century fort that has been the base of all sorts of legends and rumors, this creepy abandoned fort is only available for visits during day time – since even the government is convinced of its spooky enough to ban visitors post sunset. India’s been relatively slow to jump on the microbrewing bandwagon, but cities across the country are increasingly finding new breweries pop up at a decent pace. Hit up one of the country’s top microbreweries , whether it be The White Owl in Mumbai or 7 Degree Brauhaus in Gurugram. There are few better ways to ground yourself than to visit places like Nubra Valley – larger than life by both natural beauty and historic importance. Formed by the meeting of rivers Shyok and Siachan, this unimaginably stunning valley stands just an hour from the ancient Karakoram Pass – an important point during the days of the Silk Road. India is home to countless ancient temples of various religious affiliations – Hindu, Jain, Buddhist and more. Visiting any of these can be a defining experience, particularly when you are younger. Maharashtra’s Ellora Cave Temples dating to the 10th century and earlier is always a good option. 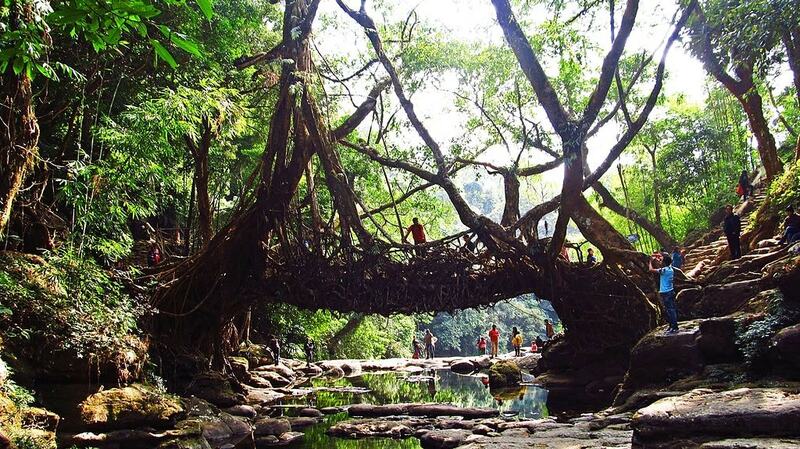 Meghalaya’s living root bridges are among the country’s most stunning natural wonders. Made by knotting the living roots of local rubber trees across streams, these beautiful bridges have been used by the local people for almost two centuries. Cherrapunji, is among your best options to catch a glimpse of or even try walking on these bridges. This cold desert mountain valley in Himachal Pradesh is a unique trekking destination, yet one that has stayed mostly off the tourist radar. Check out our comprehensive guide to the best things you can do in this picturesque valley town surrounded by arid mountains and adorned with stunning glacial lakes. Also known as The Great Indian Desert, Rajasthan’s Thar Desert is an exceptionally stunning stretch of terrain that demands to be explored. It also happens to make an excellent location for a truly memorable and immersive camping experience. Sunburn, Asia’s largest electronic music festival is a three day event usually held at the very end of the year. Set currently in the Kesnand Hills of Pune, and previously in Vagator, Goa, this is one large celebration of music flooded with twenty-something year olds. Holi is among India’s most playful festivals, and one you will likely find more fun the younger and more carefree you are. You should aim to attend this delightful festival of colors at Vrindavan, the birthplace of Hindu deity Krishna and the country’s most popular Holi playing centres, at least once.